Gluten-Free on a Shoestring: 125 Easy Recipes for Eating Well on the Cheap by Nicole Hunn is a cookbook dedicated to helping those who want or need to avoid wheat save money on gluten-free meals. The gluten-free diet has helped many people and there is an increasing amount of awareness and readily available foods but oftentimes prepared gluten-free items are 3 or more times more expensive than their gluten-containing counterparts. With Gluten-Free on a Shoestring, you not only get a wide variety of recipes but also meal planning strategies, advice on where to find the best deals on gluten-free products and tips on what you should keep on hand to make gluten-free meals easy and affordable. This is considerably different from many gluten-free cookbooks which will recommend one or more pricey flour alternatives and other expensive ingredients. And it is far, far more cost-effective over buying pre-made gluten-free baked goods. Shoestring Strategies which tells you how to not only save at the store but how to make large batches at home for cost savings and convenience. Tips on what and where to buy. Recipe basics which covers sauces and doughs that are used as the base for other recipes. Breakfast including recipes for typically wheat-heavy products like bagels. An entire section just for bread, one of the most missed items on a gluten-free diet. Comfort Meals like mac and cheese. Desserts including cookies and brownies. There is also a metric conversion guide and index. 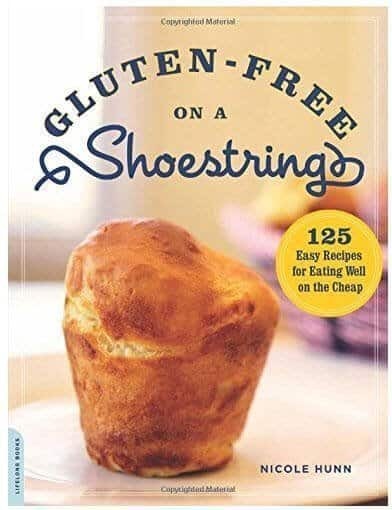 With over 450 positive reviews on Amazon Gluten-Free on a Shoestring is making many gluten-free people’s lives easier, healthier and tastier. The fact that the cookbook focuses on making gluten-free cooking easy, convenient and cost-effective is appreciated by many readers who were tired of other gluten-free recipes calling for expensive or hard to find ingredients. However, at least one reviewer noticed that there were inconsistencies between the book and the blog many of the recipes were originally featured on. The blog also contained pictures that the cookbook did not, further clarifying how steps should be performed. It is likely worth checking out the website along with the book to make sure the recipe is correct. One reviewer says: My blood pressure had been averaging 140/88 (taking two blood pressure medications). Now, after only two weeks of wheat-free eating, I’ve averaged 124/68 for the past four days. I’ve reduced one of my medications to keep my blood pressure from dropping too low after it fell to 108/58. It’s crazy!